CLICK HERE TO WATCH THE SLIDESHOW VIDEO OF THIS CAKE!!! As a kid, one of my favorite memories with my middle brother was playing Super Mario Brothers on his Nintendo. He loved that game, and was good at it. I remember climbing the stairs to his room in elementary school, only to find him sitting on the floor, entranced in the game. I asked if I could play, and without looking away from the game, he nodded, told me to sit next to him and he would hand me the other controller when he got to another level. Those were some good times. So, to this day, anytime I see Super Mario Brothers or that original Nintendo, I think of those memories I have with my brother…and I even set his ring tone to the theme song. Couldn’t help it. So, for his birthday this year, I HAD to make this cake for him. Let’s start with the Nintendo. I got a head start on this a couple of days before I made the cake. The controllers are made out of chocolate, and I used a mold to make these. I ended up making 4 of them, since it was a little challenging with the shape of the mold and all of the colors. I wanted some wiggle room in case I messed one up…and very glad I did. 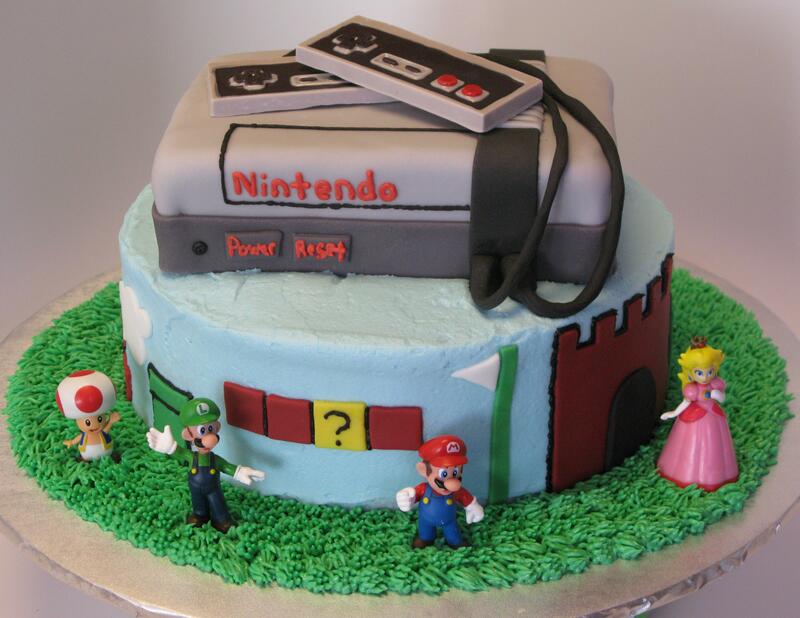 The Nintendo is made out of rice krispie treats, covered with icing and fondant. I just used the storebought rice krispie treats, and I believe there are 12 1/2 of them in here to get that rectangular shape. It is completely covered with fondant, and I hand wrote the words with red icing, drawing the black lines with black icing. 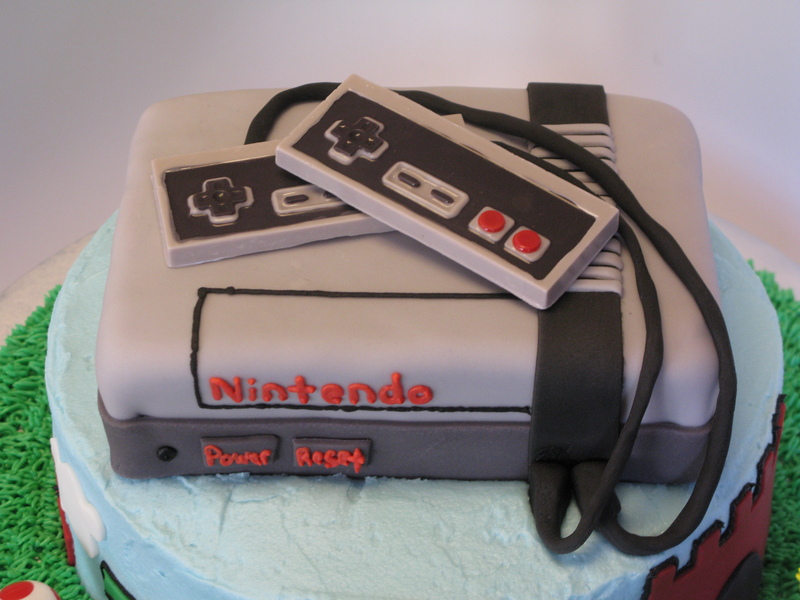 The cords are also made out of fondant, attached with icing. 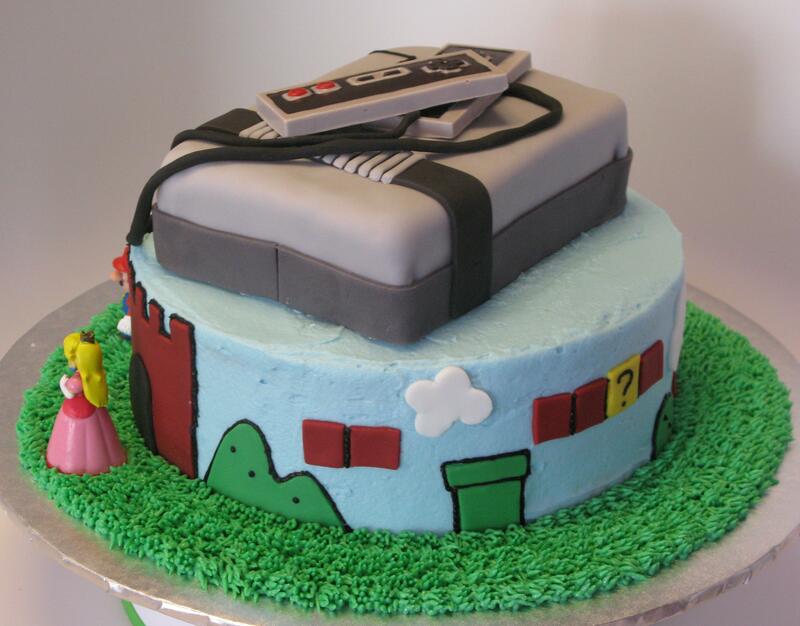 There are two dowel rods in the cake to prevent the Nintendo from sinking into the cake. 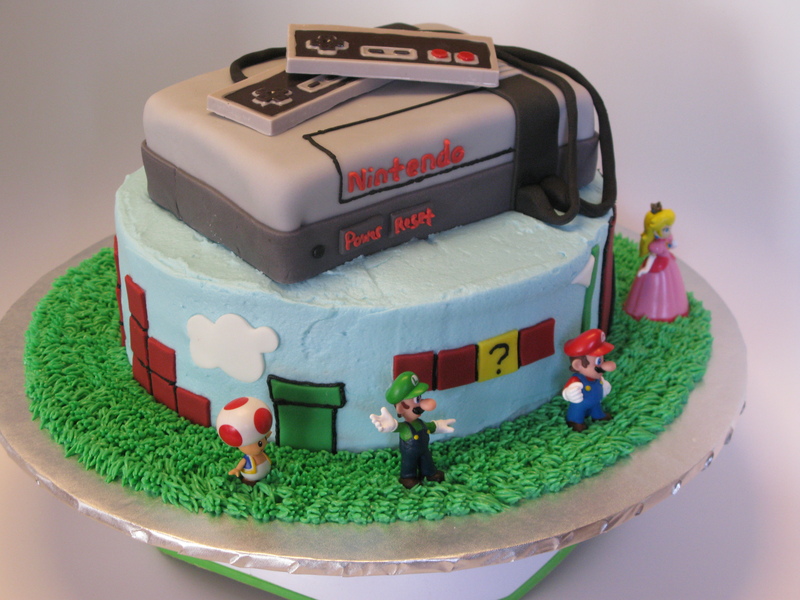 When I was looking at other Nintendo and Super Mario Brothers cakes, I didn’t see one that combined the actual game system itself AND the background decorations of the game…and I wanted both. 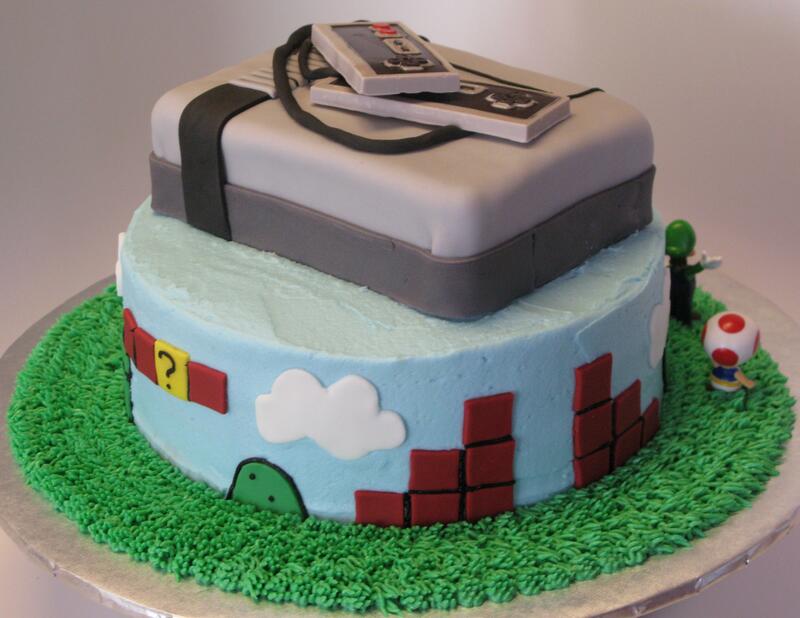 So, that’s why the cake is covered in sky blue colored icing, and the background of the game is around the side of the cake. I bought the figurines from Amazon, and placed them around the cake in front of the background. All of the background cutouts are made out of fondant, and were made ahead of time and stored in an airtight container so they were still somewhat flexible when they were put on the cake. Black icing was traced in between the bricks and used to help accent some of the colors a little better to make them stand out. The cake is a 3 layer 9 inch yellow cake covered with cream cheese icing. I actually mixed the standard decorator icing with a little bit of the store bought cream cheese icing to make it smoother than the regular cream cheese icing, but also to add a little flavor to the decorator part of the outside. Overall, this has been one of my favorite cakes! So cute. Your bro is sure to love it! The Nintendo console and controllers are especially impressive. Good job! Thank you! He LOVED it!